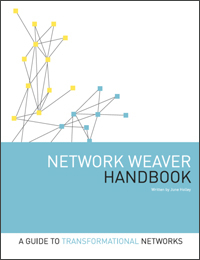 My friend and colleague, June Holley, has written a much anticipated book, The Network Weaver Handbook. If you are interested in building networks or working as Networked Nonprofit, you need this book right now! Note from Beth: I’ve just returned from leading an intense “Networked NGO” training for Packard Foundation PRH grantees from Pakistan. The four-day workshop covered effective practices of networked ngos, including culture change, integrated social media strategy, and tactics. I worked with a group of eight organizations with two staff people from each.